Couscous, Tomatoes, Basil, Mozzarella, Thyme for Cooking easy side. 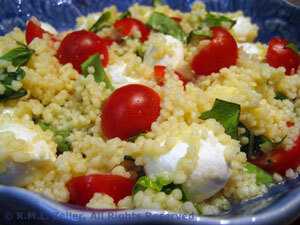 Caprese Couscous.... France / North Africa meets Italy. The best thing about couscous (besides the taste) is that it requires no cooking - just hot stock. Then add anything that suits your fancy! Cut mozzarella balls in half. When couscous is ready, uncover, add remaining ingredients, fluff gently with a fork to combine and serve.